BLT Pasta Salad is the ultimate way to bring greens to a party while maintaining your dignity. Although I certainly appreciate a green salad at any social gathering, I recognize that arriving with a giant container of baby spinach won’t win you the kind of love and admiration showered upon the guy who shows up with Greek Layer Dip or Garlic Chicken Wings, and it definitely won’t result in Mini Cheesy Pretzel Dogs-volumes of applause. BLT Pasta Salad offers the best of both worlds: it tastes naughty enough to earn potluck praise but is healthy enough to feel good about your second (and third) helping. With smoky, salty bacon, juicy, plump cherry tomatoes, and a creamy, herby ranch dressing, this BLT Pasta Salad is guaranteed to send you home from any gathering with an empty bowl and full list of guests requesting the recipe. The secret to keeping this BLT Pasta Salad recipe on the healthier side without sacrificing flavor is the ingredients themselves. I used good quality, thick-cut bacon that I purchased right from the butcher case at my grocery store. You only need four slices, so for me it was less expensive to buy a few great pieces than an entire pack of the usual stuff, and the flavor when you purchase it this way is so much stronger, you get more bang for your bacon buck. I also swapped the BLT classic iceberg lettuce (which never fails to remind me of soggy crackers) for a mix of tastier spinach and crunchy romaine. Ripe cherry tomatoes add summery brightness, and whole grain pasta provides fiber and makes the BLT Pasta Salad filling too. What really makes this BLT Pasta Salad boss, however, is the herby ranch sauce. I’ve seen similar versions of this dish made with bottled ranch dressing and mayo, which to me has never been worth the indulgence (I’ll take another burger and two grapefruit margaritas instead, please and thank you). Instead, I used plain Greek yogurt and my latest dressing discovery, Tessemae’s Ranch Dressing. It’s made with only natural ingredients and is the lowest calorie, best-tasting ranch dressing I’ve ever experienced, thanks to a genius base made of coconut milk (yes, it’s vegan too!). I’ve talked about Tessemae’s products before (reference: Easy Baked Beans; Veggie Lo Mein with Soy Ginger Sauce), and I just can’t help myself from bringing them up again, because I truly believe in what the folks at Tessemae’s offer, and I really really want you to try them. In fact, I want you to try Tessemae’s products so much, I’m offering everyone a discount! See the bottom of the post for more details and special offer code. BLT Pasta Salad also tastes great either cold or at room temperature, so you can set it and forget it at your next gathering. Well, if a giant bowl of bacony, herby, creamy pasta goodness is the sort of thing you are capable of forgetting. Me? I’ll be hovering by the dish, waiting to swoop in for my next round! 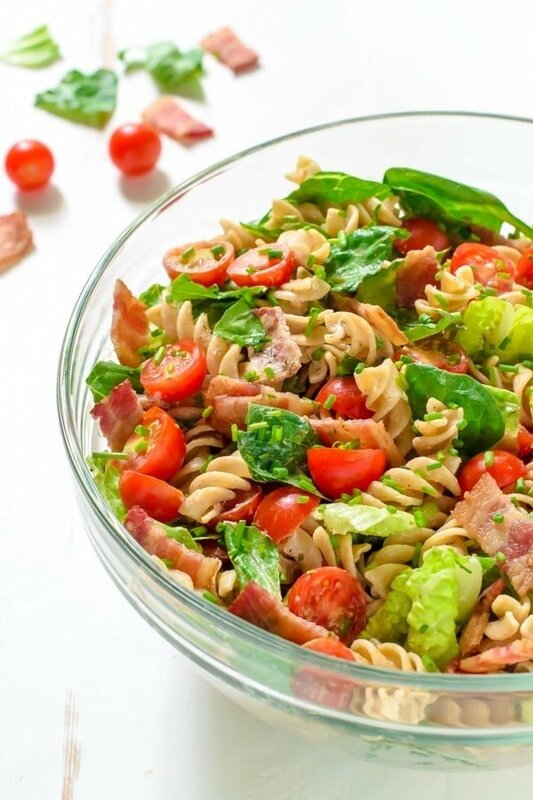 This BLT Pasta Salad stars the popular combination of bacon, lettuce, and tomato in a creamy ranch dressing that's healthier than most. A guaranteed crowd pleaser! If necessary, cook the bacon according to these easy steps. When cool enough to handle, cut into chunky, bite-sized pieces. In a small bowl or measuring cup, whisk together the ranch dressing, Greek yogurt, and black pepper. Pour over the still-warm noodles, then toss to coat. Gently fold in the cherry tomatoes, romaine, spinach, 3 tablespoons chives, and reserved bacon. Sprinkle with additional chives for garnish. Serve right away, at room temperature, or chilled. Leftover BLT Pasta Salad can be stored in an airtight container in the refrigerator for up to three days. The pasta will dry a bit as it is stored, so feel free to moisten with additional ranch dressing prior to serving again. DISCOUNT ALERT! Tessemae’s is offering all Well Plated readers 10% off their Tessemaes.com purchase. Just enter the code ErinTesseFamilyDiscount at check out to claim your savings. I created this post in partnership with Tessemae’s. As always, all opinions are my own, and thank you for supporting the brands and companies that make it possible for me to provide quality content to you! Confession: I’ve never had a BLT. But also true. I’ve been craving one. How is that possible? Bacon. It must be my first love. Bacon. This BLT salad is something that I can bring to my neighborhood block party holding my head high! Thanks for the spark. Yessssssss! Usually pasta salad is such a drag, with a confusing mayo dressing clinging to bits of celery and olives, no one understanding a lick of what’s going on. But this?! This I can get behind! And not *just* because you included bacon (although.. I gotta say, that’s pretty influential! ), but because it looks both rich and light and refreshing and easy and ooh! So weird. Mr. B and I were talking the other day about our craving for a BLT sandwich. Um, this pasta combo looks off the charts! So making! BLT’s are the definition of summer, to me! We just stocked up on bacon from Costco so we always have that as an option for dinner. I’ll keep this pasta salad for those times when we run out of bread and can’t even make a sandwich! Love it! Brilliant! This will be perfect (and so pretty) to bring to our friends BBQ ribs dinner Saturday night! Thanks, Erin! This is the PERFECT party salad! I still haven’t had a BLT yet this year, so this is just what I need in my life! I love that this is lightened up! Looks like a dish both my husband and I could agree on (which can be difficult sometimes)! What a way to start off a post! Hilarious and true. I can’t resist pasta salad or BLTs so this recipe is pretty much my spirit animal. Thank you for sharing and I can’t wait to try it! I love that you outlined how much praise we can expect to get depending on what recipes we bring to a potluck! This sounds awesome with the spinach instead of iceburg lettuce, and especially that dressing!! I’m on the hunt for some pasta salad recipes I can make and bring on our sailing trip this weekend…and I already know this group likes BLTs! This looks great and the BLT is a totally unique twist! Healthy but also a crowd pleaser? I’m in! What a beautiful pasta salad. It has all of the flavors I love…especially bacon! Definitely have to try this next time we have a grill out or picnic! It looks so yummy! i had my first BLT of the season last week. SO good. love this pasta salad idea!! Bringing this pasta salad to any potluck would totally make me the cool kid instantly! Too bad it would never make it out the door before I devoured it, though. I love anything BLT and this salad looks amazing!! This has to be the ultimate pasta salad! BLT’s are the best, but I’ve never tried a salad version of it before. What an amazing idea. The photos are making me so hungry too!! Have I told you how much I love pasta salads??? A lot. Like a lot a lot. Especially when they’re creamy and include things like bacon and juicy tomatoes. One thing about this salad is really driven me crazy is the bacon. I’m so tired of healthy food. I miss bacon so bad. You are my hero. Blt Pasta Salad, definitely on dinner list. Hi Lee! I’m so happy to hear that you enjoy my recipes. That makes my day! I don’t calculate nutritional information for any of my recipes for a variety of reasons, which you can read about here: http://www.wellplated.com/faqs/. If you would like to know the nutritional info, I know there are many free calculators online. A quick Google search should give you some options. A coconut milk base? Really? Can I just tell you how much I love being inspired: first because it gets me motivated and psyched about my recipes to come; and second because it is the opposite of being discouraged. Yummy salad!! I’m so tired of pure pasta salads. I love the greens added to it. I added a bit more romaine and used Trader Joes ranch ( couldn’t find the Tessamae ranch, but I did buy a couple of their other dressings). My mother, who is fighting cancer and a suppressed appetite gobbled it up!! Thank you for a great recipe! Going to make it for the 4th! Love your blog!